Maximise return, rebalance assets using a spreadsheet solver. High return, low risk. If it sounds too good to be true it probably is, and the most lucrative ventures invariably stand the highest chance of failure. Sadly, the opposite is not necessarily true. Low returns do not automatically mean low risk. For the cautious investor, Modern Portfolio Theory offers a salve to volatility: diversification. That is, spreading both returns and risk across a range of assets; to adapt a saying, placing your eggs in different baskets (and perhaps - for the paranoid investor - keeping a few eggs out of the baskets, under the pillow, or in another farm). TLDR. Just look at the picture. The adage sounds common-sense, but offers no guidance as to how many eggs into which baskets. Every level of risk can be achieved by different blends of assets, each mix delivering varying returns. A medium-risk portfolio can deliver medium returns, or it can deliver mediocre ones. 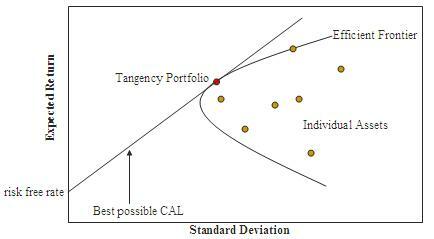 I will not try to find the theoretical 'Efficient Frontier' - the formula for optimal asset allocation at any risk level - because frankly, the math is beyond me. Furthermore, a portfolio may come with a lot of uncomputable limitations, especially if it involves less liquid assets like real property or options. Instead, let's aim lower and use the solver function that comes with most spreadsheets to optimise a portfolio for a chosen risk level. Get risk and return data for your assets. This is the most tedious part. We must decide what we mean by risk. Beta? Variation by month or year? Also, what is meant by return? Year-to-date? 5-year? This brings to mind the ubiquitous boilerplate: "Past performance is no indicator of future performance." In fact, past performance is even no indicator of past performance. For example, superannuation outperformed both local and international stock markets over 2014, but underperformed the preceding 5 years. Superannuation has enjoyed both high return and low volatility; an exception to the longer term. [Point: I think this is due to the favourable tax treatment of superannuation fund income rather than the expertise of the trustees.] So we expect superannuation-heavy solutions. In researching, I support choosing time spans similar to your investment horizon, but short timespans may be no more relevant to short horizons than longer-term ones. I also support using your own data rather than that published on the internet. After all, you bought assets, not statistics. When asked as a child what you wanted to be when you grew up, did you say 'Quant'? Well, this step will make you wish you did. Google Sheets now requires an add-on for Solver. You want to maximise the Total Weighted Return for a given Total Weighted StDev by changing the Weights. Practical: Constant Real Estate weight, reflecting the illiquidity of houses. Legal: Superannuation weight can not decrease (before withdrawal age is reached). Strategic: Set maximum and minimum weights to stop the computer from mistakenly putting all your eggs into one basket on the basis of unreliable or unrealistic (e.g. superannuation) data. Click 'Solve' and let your computer zip through tens of scenarios in the time it takes to blink. You should arrive at a result within seconds. It's fast enough to let you play with different iterations of inputs, which makes it quite addictive. You will eventually reach portfolios with higher returns for the same risk level, or a lower risk level for the same returns (as above). Analyst Recommendations, if I'm thinking of buying more shares. Moving Average Crossovers, to make sure I'm getting a fair short-term deal on shares. Global market proportionality. The U.S. market represents a third of global market cap. How much weight does it have in your portfolio? And, so that I don't get sued or prosecuted for giving financial advice, use your common sense. Put your money where your mouth is. I did. Solver only works for linear models. If you have too much interdependency, it's not going to work and may error out. This matches Modern Portfolio Theory fine, as it assumes you will invest in assets with little to no correlation. Although no asset class is truly independent - easing has inflated asset prices across the board - bank interest and shares follow each other less so than two shares on the same exchange. The value of this exercise is lessened somewhat by the varying quality of data. Who knows, at any point in time, what a house is worth? And if a portfolio's cash component also doubles as a transaction account for trades and dividends, that muddies the figures significantly. Variation in returns between periods may lead you to choose data that confirms your biases. You have been warned. It is thus tempting to use this exercise for optimising equities packages. After all, the data is consistent and clear, and there are uniform measures for value (Price/Earnings) and risk (Beta).